i b i k e l o n d o n: As another Londoner is killed whilst riding a bike, how DARE the Canary Wharf group talk of "damage to growth"
As another Londoner is killed whilst riding a bike, how DARE the Canary Wharf group talk of "damage to growth"
This article was originally titled "as another Londonder is seriously injured riding a bike", however very sadly it was just confirmed that the female cyclist who was hit by a lorry on Friday has sadly died of her injuries. (Source) My thoughts go to her loved ones. My anger only grows. A steady stream of London businesses have been pledging their support for the Mayor's ambitious new Cycle Superhighway plans - from the smallest of start ups to behemoths of the City - one after another they've come forward with comments like "build it", "great for London" and "keep our employees safe". Last week the Evening Standard revealed the massive support among London residents for keeping our cyclists safe; 64% of those polled support the Cycle Superhighway plans as they currently stand, the majority back building segregated cycle infrastructure even if it means taking road space from other traffic and - perhaps most tellingly - a massive 71% of those polled (who came from all economic and political backgrounds) NEVER drive in central London. "Brave new world", you might think, but when looking around my own office that's a simple reflection of reality. Our Head of Investment catches the bus to work when he is staying in his London home. Our company cook rides a bike across Vauxhall Bridge every day, and loves talking about cycling with one of our most senior lawyers who has a fleet of gorgeous bicycles at her disposal. Plus ca change, plus c'est la meme chose. The Canarf Wharf Group have admitted (to Guardian journalist Peter Walker) that an anonymous briefing paper against the Cycle Superhighway plans had come from them, and that they had been lobbying against the proposals, even sending a lobbyist stuffed with misinformation to party political conferences. It clearly had an effect; local MP Jim Fitzpatrick has been spouting some dubious and drip-fed figures in Parliament whilst the Guardian's Dave Hill - usually a voice for cycling - has adopted a "calm down dears" attitude. On Thursday the 16th October Canary Wharf Group told the London Evening Standard "[we] believe that certain elements of the proposed east-west cycle superhighway could be improved to ensure not only that better and safer provision is made for cyclists, but that there is no damage to the growth and day-to-day operation of London." 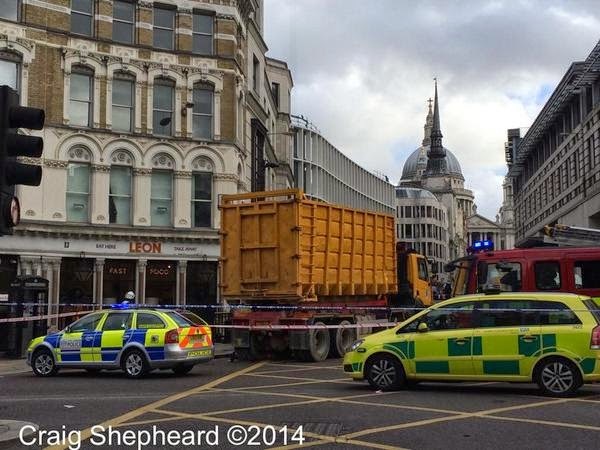 The following day, Friday the 17th October, the same newspaper reported how a female cyclist went in to cardiac arrest on Ludgate Circus after she and her bicycle were crushed beneath the wheels of a left turning tipper lorry. Her crash took place just a few metres from the spot where earlier this year another cyclist, Victor Rodriguez, was killed when his bicycle disappeared beneath a truck. At least 7 cyclists have been killed or seriously injured on this one spot alone since 2008. *see update, above. Photo via @craigshepheard on Twitter with thanks. Fourteen London cyclists were killed in 2013, six in a single two-week period alone last November. Each one had a valuable role to play in our city: from students to eminent Doctors, from hospital porters to famous architects. It is not just the friends and family of each of these cyclists who notice their loss, but the wider city too. And on a purely logistical basis, each time one of these terrible tragedies occur the emergency services are scrambled, road crash investigators are roused, the roads on which they take place are closed for many hours. How DARE the Canary Wharf Group talk about damage to the growth of London, when it is London's own who are being killed in such great numbers on our roads. How DARE they go about briefing against these plans, seemingly more concerned about the speed of a handful of car trips vs the safety of people on bikes, when the very people who drive our city forwards are being killed on its streets. The suggestion that cyclists are somehow detrimental as oppose to central to London's economic success is a fallacy. Olympic champion Chris Boardman described those who are briefing against these plans as "old men in limos". But I know that the sort of people who are driven around London are fond of hard figures, not existential ideas about road justice. The two new Cycle Superhighways will carry 6,000 people on bikes every hour: that's the same as 20 Underground trains or 84 new London buses. They will cost about the same as 0.0002% of the colossal budget allocated to build Crossrail. 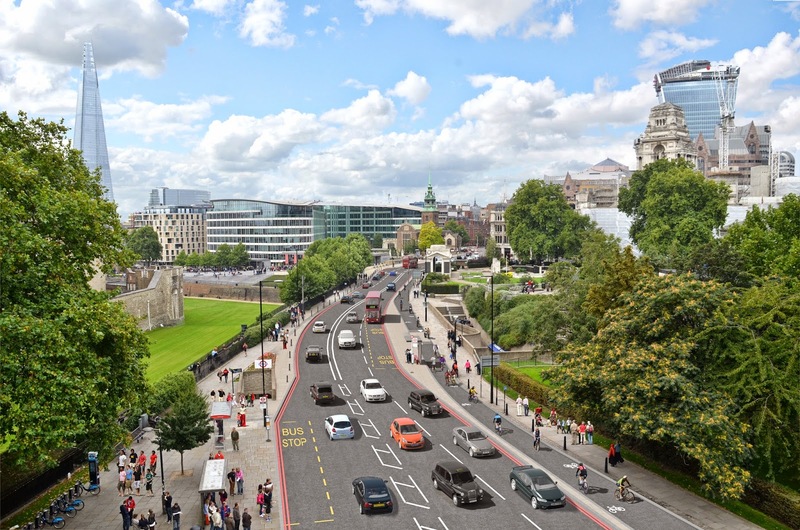 They have the support of the majority of Londoners according to the latest polls, and the support of hundreds of businesses - including Deloitte, Unilever and Argent - companies hardly in the habit of being breathless about aspirational cycling projects. 600,000 journeys take place in London every day by bicycle, or 22% of the amount of journeys conducted by Tube. This is against a backdrop of decreasing car use in central London. In Westminster, where Mr Anderson lives, traffic volumes have fallen by approximately 25% since 2000 according to the Department for Transport. Assuming that something odd happens and traffic volumes don't continue to fall, and taking in to account the impact of all other proposed road schemes, and assuming that the new cycle routes will not lead to people changing their travel habits and traffic evaporation occurring, once built the average journey time in a car from the City to Whitehall will increase by a negligible 19 seconds. In short, bicycle transport in our city is now a big deal, a good thing, and it is not going to go away. It's time we started to keep all of those cyclists - all of those Londoners - safe, rather than pushing for faster journey times for company directors in chauffeur driven cars. And here's another fact that is worth pointing out: the north / south Cycle Superhighway currently being proposed crosses the exact spot on Ludgate Hill where the cyclist was crushed on Friday and where another cyclist was killed in April. If these plans which the Canary Wharf Group are briefing against do go ahead, cyclists will be separated in space and time at this junction from other traffic. That is to say, there is a possibility to make safe a known problem junction where people on bikes being killed or seriously injured has become an alarming statistical probability. Why would anyone want to brief against that? I agree with Danny Williams at Cyclists in the City blog. It is imperative that Peter Anderson from Canary Wharf Group has nothing to do with the funding decision for the Cycle Superhighway plans at the finance committee in November. 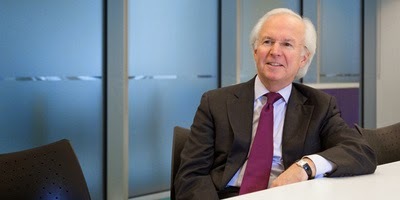 Furthermore, if he is to retain his positions at Transport for London he must declare his interests and disclose exactly the extent of the Canary Wharf Group's lobbying to their tenants, to journalists, to business groups and to politicians at party conferences against the Cycle Superhighway plans. The sort of people who rise to become Financial Directors at companies like the Canary Wharf Group have an intrinsic understanding of how gambling works. In this instance, they've played their hand, but I think they've lost. It's time they threw in their cards. For more facts on the Cycle Superhighways and their likely impact, The Guardian have churned the data to bring us this Reality Check: will Crossrail for bikes bring gridlock to central London? To make your own contribution to the Transport for London consultation (every voice counts!) visit the proposal's designated page here. Mark One of the key things missing from all those fine words and plans is the delivery of an objective, independent and impartial investigation of road incidents to the same standards as we see for Rail, Air, and Marine transport modes. The reports from RAIB, AAIB, and MAIB are published on-line - go read a few - and they list all causal factors, and from this develop learning points with firm, precise, recommendations for the actions that HAVE to be taken to prevent a future incident. The regulators for Rail, Air and Marine (ORR, CAA, MCA) then instruct the operators and providers of vehicles and infrastructure to act, often with a clear time limit. As a result we have for all practical purposes achieved 'Vision Zero' for rail air and marine transport. A passenger fatality on the railway is almost unheard of. So what do we have for the roads ... Section 39 of the Road Traffic Regulation Act 1988, from the wording alone it is clear that this is not fit for purpose. "The roads authority MUST investigate crashes but then they MUST ADVISE THEMSELVES(!!) on measures to prevent future crashes, and promote road safety. As Juvenal noted over 2000 years ago Quis Custodiet Ipsos Custodes. DfT could make the best of a poor job by promoting clear guidance on the way Section 39 should be delivered, but they don't seem to be doing so. TfL's efforts are marginally better than most Councils - they actually have some data on-line, but the detail is so limited as to make it of little use. By way of an example - and to pinch a line from Lady Bracknell "To have one fatal crash is unfortunate, to have more than one fatal crash in the same circumstances seems culpably careless" and we have some clear examples of this in London. Currently, I believe, there is an outstanding Regulation 28 call on Camden Council and TfL from the Camden Coroner for answers following the second death in 5 years through the driver of a large vehicle attempting to make the left turn at the junction of Vernon Place and Southampton Row in Holborn. To make the turn the drivers approach in the lane(s) marked for traffic going straight ahead (or turning right) and then force the traffic using the nearside lane to yield priority (which would appear to meet the criteria for a charge of dangerous driving - forcing other road users to alter course or speed to avoid a collision by a deliberate action). For Wan Chen McGuinness and Francis Golding that deliberate decision to drive through the route on which they had priority to travel straight ahead had a fatal outcome. The solution at this junction, and others such as the one in Camberwell where Richard Muzira died in a near identical crash is direct and simple, and often immediately deliverable. At junctions where a large vehicle cannot make a left turn from the nearside lane(s) marked for turning left, the left turn should be banned to large vehicles. We now have a precedent - following Elle Carey's death on Tower Bridge Road, the left turn into Abbey Street was banned. The Vernon Place left turn is sub-standard in terms of road geometry - the kerb radius is around 4 metres, instead of the 6 metres requirement for a large vehicle turning, the angle is greater than 90 degrees, and the junction is closed in by pedestrian guard-railing and traffic signal posts. A route already exists to get large vehicles on to Southampton Row, by making 3 right turns via Theobalds Road, Proctor Street and High Holborn this should be delivered immediately, and a review of EVERY junction of that type in London. My office is barely 100 yards from the scene of last week’s tragedy, and in fact if you stand in the right place you could see the scene from inside our bulding. I became aware of it when going out to collect my lunch when, instead of having to negotiate the normal Great Wall of Chinese buses along Fleet Street, I found the street totally traffic-free, and wondered what was going on. It was only a couple of hours later that I saw the first Twitter reports. My firm, as you know, was one of the early supporters of the proposals, following lobbying from a group of cycling partners drawing attention to them. We also remain one of the largest private-sector employers to have signed up in favour. This is no doubt at least partly because we are very direct beneficiaries of the schemes, being so close to one of the routes within a couple of hundred yards from its junction with the other. However, I think there are other reasons behind our support and the article in today’s FT (http://www.ft.com/cms/s/0/aa30abf8-48de-11e4-9d04-00144feab7de.html?siteedition=uk#axzz3Gh3PvZ7d) also describes quite a lot of how thinking on an issue like this develops in a large employer. Our commercial interests are many and varied and aren’t confined to the interests of our staff, but it remains the case that (a) we recognise a host of advantages to our staff and our business from active travel to work (better health, less sickness absence, sharper, more focussed staff who are fully engaged from first thing in the morning etc) BUT (b) we hesitate to encourage (as opposed to facilitate) staff to cycle to work in case we inadvertently put them in jeopardy – there are moral and legal implications for nudging an employee towards a place of danger. If a proposal substantially reduces, perhaps even eliminates, that risk, what is not to like? It really is very hard to understand why Canary Wharf Group would be so out of tune with business sentiment generally. You would expect the LTDA, Addison Lee, the RHA and other transport-related lobbyists to be hostile (whether that hostility is misplaced or not) but what possible disadvantage is there in it for CW? How can completing an off-road (ish) cycle link all the way from the Wharf to the West End and so opening up an additional communications channel for CW tenants possibly be a bad thing? How can it possibly impact on congestion for other traffic to and from the Wharf? How can that congestion be any worse than the dozens (remember that serious injury incidents also occur, and cause lengthy road closures while ambulances attend and police measure skid marks and photograph the scene) of closure and disruptions which occur every single year? Whose interests is Peter Anderson REALLY lobbying for? Interesting comments Paul, and I'm sorry you had to see this horrible crash scene. You raise some interesting points, not least that which says this scheme is really a good thing for CW and therefore who is Anderson really getting upset on behalf of? I'd love to know his rationale, that's for sure! Paul & mark I happened to be at a meeting with Bernard Gambrill formerly head of PR with Crossrail, and now with that hot potato of HS2. He pointed out the the whole development of the Isle of Dogs was predicated on not opening flood gates for yet another place which would generate car traffic, and hence it was vital that DLR was in place, along with the Jubilee Line, and access on foot and cycle had to be part of that plan. Of course when you see what happened to the roads between 4 and 6 pm you do wonder if the whole transport game-plan has really been managed properly, still it is a lot safer to cycle the roads at that time than during the rest of the day - most construction site HGV's go off for the drivers' breaks, as the time lost in congestion makes this the ideal time to park-up, during the day HGV construction site traffic is at least 30% of the vehicle movements, if not higher, putting the lie to the daft idea that we should ban HGV traffic during the morning and evening peaks. Operators already avoid having trucks on the road at those times, because it just isn't commercial sense to have a £300,000 tractor & trailer crawling along at under 10mph in a traffic queue. CW could be much more accessible to cycle traffic - for a start making more use of the DLR, JLE and the 108 bus to get in from South of the River.